← Howard Zinn and the Myth of the Good War. This is a highly readable account of Livingstone`s life beginning with his early years in post-war Britain, a world resembling Mike Leigh`s depiction in `Vera Drake’. London is an incredibly boring place lacking cultural diversity home life dominated by the Daily Express. His Conservative voting parents were socially enlightened although Victorian values permeated Livingstone`s upbringing, to escape he read Orwell, political awakening coming from Horowitz in 1967 `From Yalta to Vietnam`. Harold Wilson`s position on Rhodesia transformed Livingstone`s initially high opinion of the Labour leader and Livingstone delayed joining the party repelled by Callaghan`s treatment of Kenyan Asians. Racism was a strong generational factor his uncle a member of Mosley`s Black-shirts who refused to watch television featuring black or Irish personalities. Livingstone outlines the racist Conservative campaign during the Smethwick election in 1964 setting the tone for UK politics. 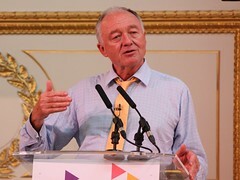 The Labour Party mimicked this agenda illustrated by comments made by Mellish and Richard Crossman, notable non-racist exceptions such as John Fraser MP encouraged black political participation which attracted Livingstone to the Labour Party. Livingstone also worked at Chester Beatty with brilliant “research doctor” Tom Connors and drew closer to Ghanaian colleagues because of Ian Smith`s “racist government in Rhodesia”. While Paul Foot and others rallied to the International Socialist Group, Livingstone joined Labour in 1969 his maiden speech a critique of `In Place Of Strife` though he was not on the left adopting a centrist position. Livingstone effectively became a full time councillor in Lambeth and the GLC, developing ties with Trotskyite Ted Knight. Politically Ken was drawn to Tony Crosland, supporting troops going into the North of Ireland, to protect the Catholic population. Livingstone altered his view on Ireland and appears politically shaped by other factors evident at the time such as feminism and Gay Liberation. During this embryonic period he developed a clear understanding of how government worked, specialising in housing policy describing the valuable political/administrative apprenticeship local government provided. Blair and Cameron`s first experience of government was in running the country, a lack of know-how Livingston argues which places inexperienced politicians into the hands of advisors and bureaucrats. The GLC is associated with an agenda that is now common place, anti-homophobia, women`s rights and anti-racism but Livingstone quoting John Carvel points out the tabloids began to focus on him in a negative way. Advances in social policy were made due to the stance the GLC made in the face of malicious and ugly opposition that continued throughout Livingstone`s career. Although Ken wrote for the tabloids his meetings with Robert Maxwell are highlighted. Livingstone still made contact with Gerry Adams setting a precedent for Blair during the Northern Ireland Peace process, a brave decision in the 1980s. He also laments the failure of the parliamentary left in 1987 to find common cause between the Campaign and Tribune groups, granting Kinnock a free hand to implement his policy review. Livingstone`s maiden speech dealt with Britain`s `Dirty War` and `Operation Clockwork Orange`, he was castigated in the tabloids for this but points out in 1990 Alan Clarke vindicated him. During this period Livingstone developed his economic thinking through his association with John Ross a “statistician of formidable intelligence” this led to the setting up of the `Socialist Economic Bulletin` the research interest of this journal groundbreaking but sadly the Labour leadership ignored it. There has been a remarkable degree of consistency in Livingstone`s policy objectives evident on becoming Mayor (as an Independent) his focus on housing, policing, improvements in transport and Ireland. Livingstone is a pragmatist even his much vaunted congestion charge he says was an idea borrowed from free-market economist Milton Friedman. While Ken`s trade union credentials are impeccable – generating massive support from the trade unions when running for the Labour nomination to become Mayor (which the Millbank Tendency ignored). He criticised the Conservative Employment legislation and the lack of repeal under Blair/Brown but on becoming Mayor faced with industrial action by the RMT Ken condoned the crossing of picket lines – a pragmatic decision justified in the book. Livingstone was quick to take the focus away from the UK`s Muslim population and set himself valiantly against Islamophobia. He makes absolutely no excuses for terrorism his search for causes are analytical. Livingstone`s reference to former President Jimmy Carters, who at the behest of the pentagon dragged the Soviets into Afghanistan into their own `Vietnamese Quagmire` is a compelling argument and like the rest of this excellent book deserves to be read.